Well of Darkness is the third chapter in the Iron Monkey’s mythology of The Guardian of Dawn. In this chapter the Acolytes, independent and even vain from experience gained in the Agora of Light, leave their brethren and shatter forth, embarking on individual pilgrimages of virtue. Having spent many nights in the Agora of Light discussing what the world had to offer, the Acolytes are inspired and impatient to become immersed in it. The virtues they have identified at the Agora resonate strongly in six of the Acolytes. These six identify so intently with these individual virtues, they begin to believe they are the embodiment of the value. For the first time in their lives they leave the pack and head out alone, breaking new trails using enlightenment as their machete, righteousness as their shield. Their journey starts confident, cocky, and full of hope. Their initial interactions with people were bright with conviction and exaltation. Each Acolyte would advocate from the pulpit of their belief, seeing the world through the filter of the virtue they had embraced. However, something wasn’t right; they observed those with courage act without honor, justice act without wisdom. Idealism shattered, they each wondered "How can any single virtue be the only light that guides one towards a life worth living?" Confused and defeated they struggle to keep going. After endless days and nights of seeing only hope on the horizon, a dark, distant well appears. Drawn to it as a destination point they see other figures moving towards it. As their steps bring them closer to The Well of Darkness they recognize their fellow Acolytes, somehow reunited and heavy with the burdens of their virtues. The Well of Darkness is a 60’ diameter space comprised of four main components: the Well, the Acolytes, seating, and fire. In the center of the of space will be the canopied Well. The well itself will be 2’ to 3’ across, with the roof of the well extending out a couple more feet. Moving towards the well will be six Acolytes each dragging behind them a heavy steel chest. The chests will be named for each of the Acolyte’s values: Courage, Temperance, Wisdom, Justice, Honor, and Gratitude. Coins stamped with these virtues will be hanging from the Acolytes. Participants will be able to take a coin from an Acolyte and drop it in the well. Ornate handmade chain will connect the chests to their Acolytes. Seating is a crucial component of a gathering space, and we will be bringing back the benches we used in the Agora of Light. There will be six sets of three benches in triangular patterns placed throughout the space. Three of those sets of benches will have a fire zen garden in the center. At night the piece will light up. Propane will be in the roof of the well, heating up and adding light to the center of the space. Three zen gardens will be set between three sets of benches, staged like a campfire. 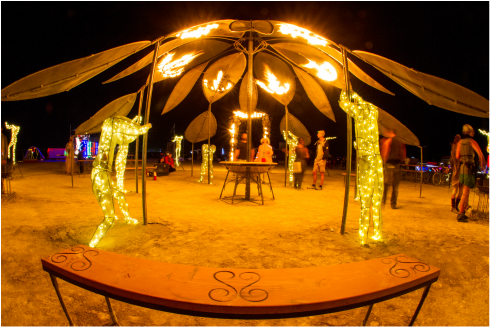 At night participants will be able to warm up while playing with the fire in the zen garden. Additionally, three of the six chests and the chains attached to them will have fire in them adding additional warmth and ambiance to the edges of the space. All the fire will be kept at a low warm blue. Creating heat but not an exceptional amount of light representing the false dawn, the light before the real dawn.